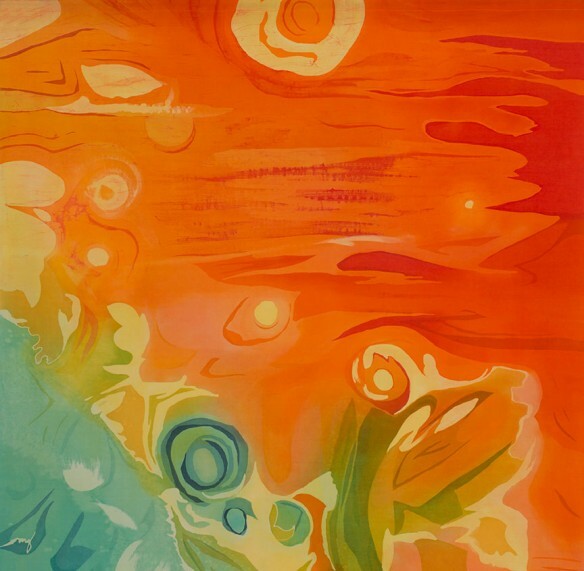 Volcanoes, batik on silk, 4′ x 4.’ Image courtesy of © Mary Edna Fraser. Mary Edna Fraser, an artist known for her large-scale batiks on silk and illustrations of geology and geography, was invited on the Research Vessel Atlantis by Dr. Cindy Lee Van Dover, chair of the Division of Marine Science and Conservation & director of the Marine Lab of Duke University. Artists were challenged to capture the essence of discovery as scientists mapped the seafloor, made measurements, sampled zooplankton, and deployed the remotely-operated underwater vehicle (ROV) Jason to collect benthic invertebrates. Sitting in the control room of the Jason, artists were able to ask the pilot to stop for them to observe the otherworldly scene and make art. On this leg of the excursion, artists created watercolors and captured video, experiencing life on a state of the art research vessel. The excitement of working alongside world renowned scientists and the incredible Woods Hole crew is apparent. Scientists too were inspired by the art being created on board from video monitors, maps and creatures pulled from the deep. Fraser’s story shows her initiation into this foreign world, where artists seldom see science and research in action, and reveals the synergy created among the 55 people on board as the excursion progresses. This video is an introduction to the exhibition Art & Science: Envisioning Ocean Depths, supported by Duke University. The collaboration has resulted in a stirring portrayal of the wondrous world of the deep ocean floor off the coast of Barbados. Cindy has a historical vision of the deep sea, paired with an enthusiasm for art as a means of reaching a broader audience. United by the excitement of discovery, Fraser’s story shows artists and scientists working together and inspiring each other in mutual wonderment. We are currently seeking venues for the traveling exhibition.